This unit is designed as a standard signal source for field use. Its main purpose is for checking the proper operation of your entire receiving system (antenna, coax cable and receiver) at the beginning of each day of field work. The beacon is useful for training new personnel, calibrating an antenna array (null-peak system, etc. ), checking for signal anomalies in a study area and finding your way back to camp at the end of a long day. It can also be made to operate as a trap site beacon. Transmitter: Crystal controlled two stage design, pulsed by a CMOS multivibrator. An LED indicator next to the antenna jack pulses in synchrony with the transmitter, verifying operation. Life Span: Nominal 50 weeks. Battery can be replaced by the end user. Pulse Width (standard): 26 milliseconds (ms). Power Output: Peak power ~5 milliwatts (mw). Housing: The transmitter is encapsulated in the waterproof case of a small flashlight. The flashlight housing contains 1 standard “AA” lithium battery. 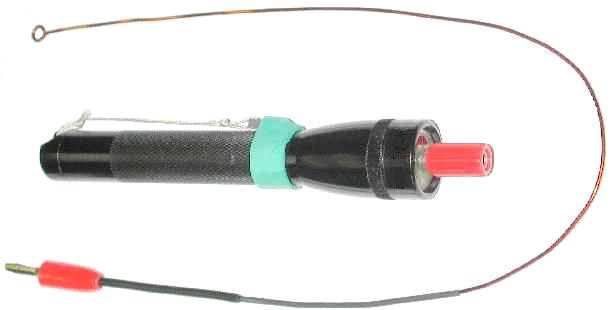 Antenna: A banana plug/binding post is provided for antenna attachment. A 1/4 wave copper wire antenna with a male banana plug is supplied. Activation: Applying the attached magnet activates the transmitter. This is opposite to our normal transmitter activation.